[REVIEW 2019] What Are The Best Cheap Espresso Machines Out There? Dipping your toes into the world of coffee? Well look no further, as we aim to help you find a cheap espresso machine that suits all your needs. Nowadays you don’t need to spend a fortune on a brand new coffee machine as you can find a good machine for the fraction of the price. Does Cheap Really Means Inferior? Cheap does not always mean bad, it simply means affordable. Since espresso machines have become so popular, companies have started to bring out more affordable models so you can make espressos at home without shelling out a load of money for the privilege. You need to be wary when buying cheaper models though as some machines don’t last as long as others, and you don’t want to be stuck with a machine that doesn’t do what you want. The cheaper alternatives are really more basic, they are smaller and do less than more expensive machines but this doesn’t mean they’re bad, they’re just simpler. Big companies put out cheaper machines as a more affordable substitute. So you know that even though it is cheaper, it is from a big name brand; that shouldn’t let you down. Who Should Go For A Cheaper Model? If you’re going for a cheaper machine you’re probably starting off and want to test the waters of espresso making, or you’re simply not too picky when it comes to your morning coffee. 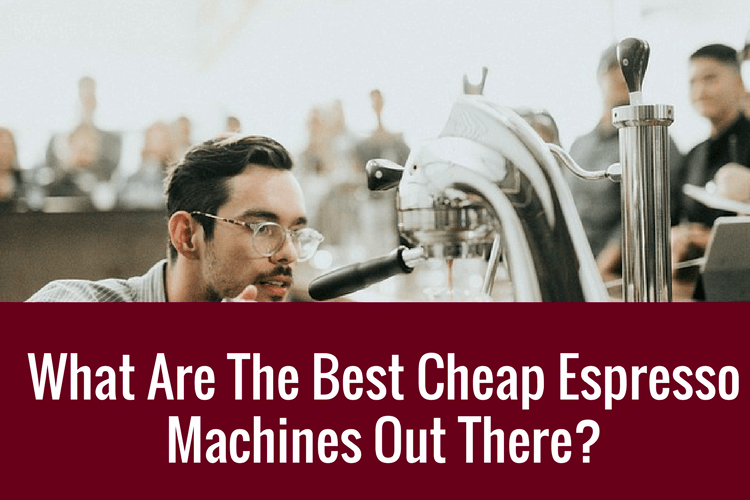 Although more affordable, cheaper machines performance can dwindle in comparison to more expensive machines, but really if it’s making coffee and you’re not too bothered by any fancy functions then a cheaper alternative is for you. Inexpensive machines are usually more basic than their more elaborate counterparts. They are usually more focused on just the coffee rather than giving you everything a coffee house can, so if you’re a coffee drinker who just wants to make basic coffee in your own home, then a cheaper alternative is definitely for you. Let's move on to the more actionable parts. These are what we think you should start off with. This machine, using Nespresso pods, creates a delicious coffee for a very affordable price. With a brewing time of 30 seconds, you will be enjoying your steaming cup of coffee in mere moments with the push of a button. The sleek and compact style of the machine also makes it easy to fit into the style of any kitchen, with minimal space being taken up. Although it is very basic and you cannot make lattes and cappuccinos with this machine, you will be able to enjoy a great range of espressos with the Nespresso pods. Though, these do rack up in price after a while as you have to buy them separately. You can adjust the cup platform with built in drip capturer to suit your coffee cup. The built in water tank makes it easier to make a cup of morning coffee as you put in a pod, turn on the machine and wait, making coffee has never been easier. With a 30 day unconditional money back guarantee and a 3 year repair warranty, you are covered if anything goes wrong with this machine. A risk-free investment. With this espresso machine by Aicok, you could be enjoying your coffee within 30 seconds of pressing a button, and as a much cheaper alternative than larger machines, what more can one wants? This machine gives you everything you need, including a programmable button so you get your perfect cup of coffee every time. This button also warns you when the water tank is low, the machine is heating up, and when it is ready for you to press to make your espresso. However, some might have issues with heating the water, and taking up a lot of water to be able to do so. Though, the machine itself comes with a 2 year warranty, so if anything does go wrong then you can get a new one sent out to you. Using pods that you put into the coffee machine means that you have a range of flavors to choose from and the 20 bar high pressure pump leaves you with coffee house style coffee every time. A simple and easy machine for someone who just wants a cup of coffee in the morning. The Mixpresso espresso machine offers everything more expensive machines do but at a fraction of the cost. With a 19 bar pressure pump, made in Italy, your coffee will taste as authentic as possible from the comfort of your own home. Making an espresso is now as easy as filling up the water tank, sticking in a Nespresso pod, and waiting 30 seconds for your steaming coffee to brew. Every machine faces wear and tear. Jamming might be an issue with some machines, although this is an easy fix with Mixpresso backing the product for 1 year so you will be able to contact them with any issues with your machine. After you have used your pods there is compartment that holds 15 empty capsules, meaning you can spend less time cleaning up and more time enjoying your coffee in peace. If you’re worried about the environmental impact of this cheaper machine then have no worries as it turns off automatically after a certain period without use. Overall this machine is compact and perfect for anyone who just wants to drink an espresso at home. This innovative machine is not only cheap but extremely practical. As it is portable, it means you can make yourself an espresso wherever and whenever you want. Being powered by a USB port, you can use portable chargers, car lighter ports or even just a regular plug to fuel this tiny machine. This machine is easy to use as all you have to do it pour coffee grounds into the basket, add hot water, press the button and your espresso is ready in less than a minute. Of course, the prerequisite is that you have a source of heat to boil water and to plug the actual machine in so as to make your steaming cup of espresso. If you are in an area that has all of this, then you’re ready to go, making espressos whenever you want. With the sleek and elegant design you’ll love taking this with you wherever you go, or even keeping it plugged in when you’re at home for a cheap and easy alternative to other machines. The 15 bar pressure pump to make sure your coffee tastes good as well as being steaming hot, you can have barista style coffee anywhere. You wouldn’t usually be able to carry an espresso machine around but now you can with the imaginative idea from T.Y.J. Mr. Coffee’s espresso machine and starter set is a little more complicated than the rest of the machines but it does deliver on both price and functions. Not only can you brew espressos but there is a milk frother. That means you can have cappuccinos and lattes as well, leaving you with many options. The learning curve for this is slightly more than the rest. You need to do more work; such as: scooping coffee grounds into the measuring scoop, making sure you have the right amount of coffee, waiting for it to pour into the glass decanter, and then steaming the milk. If you are after an easy machine that you just press a button on, then this one is probably not for you. It is more professional and allows you to be your own barista. At a fraction of the cost of more expensive machines and with similar attributes, it is definitely one to consider. If you have noticed, most of the cheaper alternatives are capsule machines. They are great for casual drinkers and really, they taste good enough. All of the machine looked at are great alternatives to more expensive machines, although the Caffé Brio STX 6000-CB is the one that I prefer. With its fast brewing time and cheaper price, it fits the bill to a T.
It has a simple design and is so simple to use that anyone can do it. The lower price range is somewhat offset by the amount spend on the pods you buy. So, this machine is perfect for someone who wants more of the spend-as-you-drink system. With the brewing time under 30 seconds, you can have your espresso any time of the day. As a basic machine it offers everything you need as a cheap espresso machine that delivers on its coffee making abilities.